I traveled to Tampa, FL to present a paper entitled “Wikipedia Collaborations, Under-representations, and Lingering Doubts” at the Conference on College Composition and Communication on March 21, 2015. Also on my Saturday panel were Dr. Frances DiLauro of University of Sydney and Matthew Vetter of Ohio University. This presentation extended the work I started at University of Sydney in February 2014. There we were able to submit surveys to students to determine how learning with Wikipedia in the writing classroom affected their attitudes about the site. 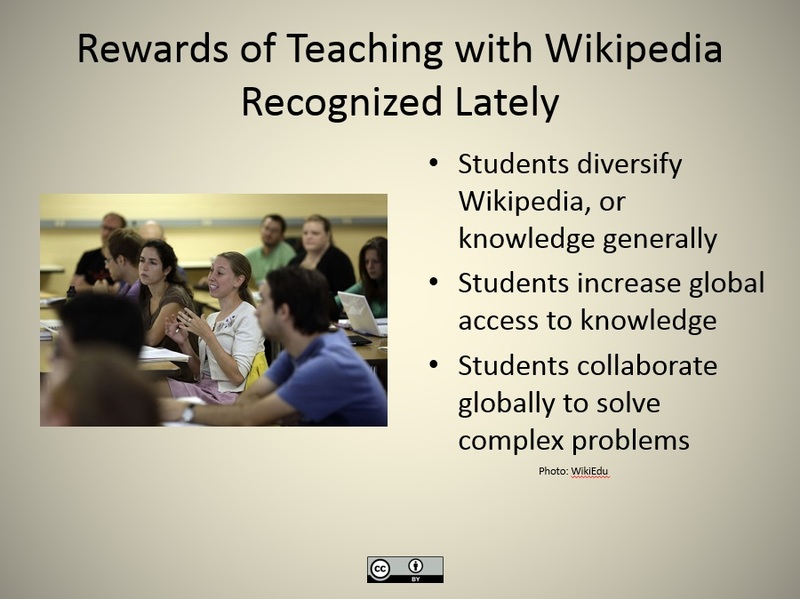 We have been able to establish their reactions to “traditional” concepts of teaching and learning with Wikipedia, such as whether students believe that learning with Wikipedia improves or hinders their abilities to reach composition course student learning outcomes, perceptions about the legitimacy of Wikipedia, students’ use of Wikipedia within and beyond the academy, and students’ attitudes about composing in groups. 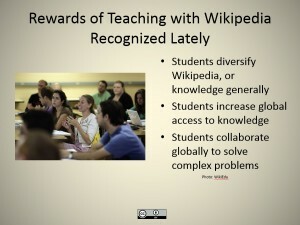 However, our study seeks to move beyond those initial concepts about students’ perceptions about teaching and learning with Wikipedia to entertain questions about the value of writing for Wikipedia and electronic networks as preparation for responding to professional contexts beyond the academy, the value of Wikipedia in helping students identify cultural difference and establish successful working partnerships with people different than them; the role of Wikipedia in helping students identify and transform a male-dominated workspace; and value of working with Wikipedia and helping students identify a new meaning for their place in the world. In addition, I presented at a panel originally scheduled for Assistant Dean Stephen Monroe. This panel met on Thursday to discuss Independent Writing Programs.